Mercedes and BMW are two ever competing German car companies. Not so long ago we noticed that on our site there is a huge amount of lessons about different Mercedes models, but for some reason we do not have so many BMW models. 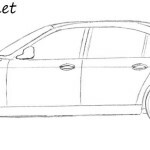 Today we decided to correct this situation, and created a lesson on how to draw a BMW M5. 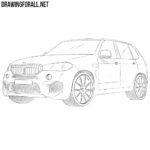 Take the pencil in your hands, and with light movements of the hand, sketch the outline of the body of BMW M5, as shown in our example. Please note that in the future we will need to erase the lines drawn in this and the next steps. Here we continue to use extremely light lines. With the help of them, we are sketching the contours of the headlights, radiator grille and bumper in the front of our BMW. In the lateral part, we need to sketch out rear-view mirrors and rounded wheels. Here we need to start using darker lines. Carefully draw the outline of the headlamps of our BMW (try to repeat their shape from our example) and the characteristic double radiator grille. Draw a round logo on the “nose” and go to step number four. 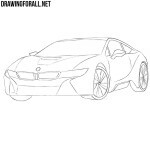 In this step of the lesson on how to draw a BMW M5 we continue to work on the front of the car. Below the headlights and the radiator grille, draw the outlines of the bumper and rectangular registration plate. Now it’s time to work with the top of the car, that is with the roof of our BMW. Continuing the smooth lines of the hood (or the bonnet, if you live in Britain) draw out the outline of the roof, then draw the windows and rear-view mirrors. In this step we finish drawing the body of our BMW M5. Continuing the roof line, draw the back of the car. Further, continuing the lines of the windows draw doors, then draw handles on the doors. Next draw out the bottom edge of the body and a long line on the side surface of the car. Since the body of our BMW is finished, we need to start working with the wheels. Using dark and smooth lines we draw the wheels of our car. By the way, we think that the step where we draw the wheels is the most difficult, since the lines of the wheel should be as smooth and round as possible. So here we need to work very well. Another difficult and painstaking step of the lesson on how to draw a BMW M5. Here we need to draw out the rims of our car. 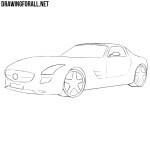 We have drawn standard rims that you can see on most BMW models, but you can of course draw any other rims. We finally got to the last step. Look at your drawing, if it looks like ours, then start working with the shadows. Use dense hatching to draw shadows, as shown in the example below this text. Also add some glare to the surface of the body and windows. Today we drew a very cool BMW M5. In the future, we plan to create many more different models of the company BMW. 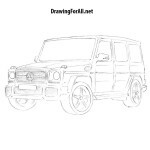 So visit DrawingForAll as often as possible, so as not to miss our new drawing lessons.